If you’ve spent any time online, you’ve encountered a CAPTCHA. The official CAPTCHA Site explains the tool. It is used to tell humans and bots apart. A CAPTCHA is a program that generates a test which humans can pass and current computer programs cannot. The term CAPTCHA stands for Completely Automated Public Touring Test to Tell Computers and Humans Apart. It was coined in 2000 by four individuals from Carnegie Mellon University. The reason for implementing a CAPTCHA makes sense; no one wants spam, viruses or worms in their inboxes or on their sites. No one who runs a blog wants to spend time filtering through spam comments. Having demonstrated the usefulness of a CAPTCHA, we are left still with the problem that the CAPTCHA has brought with it, namely that most CAPTCHAs are inaccessible, and some of those that are accessible are not usable because their speech is incomprehensible or their images are so unrecognizable that someone with blindness or a visual impairment cannot solve them. As noted above, there are some fully accessible CAPTCHAs. A site like Text CAPTCHA offers simple text CAPTCHAs for people who run websites or blogs to use on them. These CAPTCHAs consist of a question posed to you such as a simple math problem, for example. According to the official CAPTCHA site mentioned previously, there is a greater likelihood of bots finding the answer to such a simple CAPTCHA, especially if it is used on several sites. This option, while it provides an accessible CAPTCHA, seems not to be used very often and may not be as secure as some other, less accessible, options. 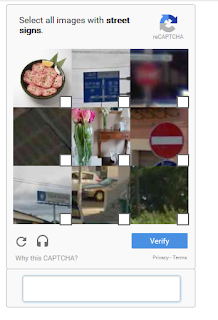 The reCAPTCHA site from Google claims to offer CAPTCHAs that are easy for people to solve and hard for bots to decode. Here is where the problems with reCAPTCHA begin. reCAPTCHA, as advertised, offers an accessible CAPTCHA which consists of spoken numbers. The demo CAPTCHA on the site is relatively easy to use. If every CAPTCHA were like this one, the problem for people who are blind and visually impaired would be greatly minimized. After a delay of nearly a minute, a CAPTCHA appeared along with an option for an audio CAPTCHA. Having selected the audio CAPTCHA, rather than letters or numbers, I received a seemingly continuous series of difficult questions. For instance, I was asked to select from the list all of the “Belgian ails.” I had to check all the correct answers using check boxes that corresponded with each answer. Later I was told to select the “Creepiest movies.” The questions never got easier. To make matters worse, some of the labels corresponding to the check boxes read inconsistently with my screen reader. Needless to say, I was unable to complete the task I sought to complete. reCAPTCHA claims to be simple to use; however, in this particular case, it was anything but easy. In another instance on another site with a reCAPTCHA, I received an audio message that said something about the computer transmitting signals of some sort. I was told to try again later. Perhaps the system thought my computer was a bot? Regardless of the reason, I decided to consider other options for dealing with CAPTCHAS. CAPTCHA Be Gone, developed by Accessible Apps, is a browser extension for Internet Explorer and Firefox. The developers hope to make it available for other browsers in the future. 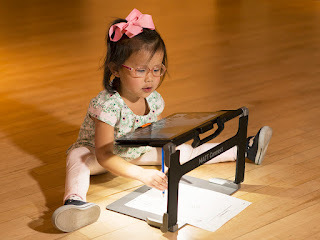 CAPTCHA Be Gone, when it is integrated with the browser, solves a CAPTCHA with one simple keystroke and places the answer on the computer clipboard automatically. Simply paste the solved CAPTCHA into the edit box on the site and hit the button to move forward, and the CAPTCHA is solved, usually in under 15 seconds. You can pay for CAPTCHA Be Gone monthly or annually--$3.50 per month ($3 monthly during the initial rollout of CAPTCHA Be Gone) and $33 annually. Since CAPTCHA Be Gone is a browser extension and not software, it is downloaded somewhat differently. To order or get more information, visit the CAPTCHA Be Gone website. You can do several things on the site, namely, listen to a demo of CAPTCHA Be Gone in action, sign up for a newsletter that tells you when something changes, find CAPTCHA Be Gone’s Twitter page, or sign up for the service. You must sign up by creating an account and follow the directions in the email you receive. Don’t worry—the site doesn’t make you solve a CAPTCHA to sign up! If you want to know more about CAPTCHA Be Gone’s developers, visit the Accessible Apps website. There you can find out how to follow them on Twitter and read about their growing list of accessible software titles including Hope, QRead, QCast, QFeed, Chicken Nugget, and QSeek. WebVisum is a free extension/add-on exclusively for the Firefox browser that, among other things, solves many CAPTCHAs. We were reluctant to include it because it has been available then not available then available and now seems to be unavailable again. According to the site that describes it, WebVisum works with the current version of Firefox; however, it is unclear if the extension was updated recently. The site states that you must use the latest version of Firefox; WebVisum will not work with older versions of the browser. Keep the following things in mind. On the page listed above, you can download the add-on; however, you cannot use it until you create an account, and you cannot create an account without an invitation from someone who already uses WebVisum. Fortunately, if you fill out the form on that page and describe who you are and why you need the add-on, you should receive an invitation rather quickly. Go to the actual WebVisum homepage. On that page, choose “Register”. Enter your information, and wait for the registration code to arrive in your email. Once you receive it, follow the directions in the email. While researching WebVisum, we discovered another problem. The extension is not "signed", another way of saying that it is considered experimental and appears not to be approved officially by Mozilla, the makers of Firefox. This matters because all add-ons that are not signed/approved, starting with Firefox 43, are disabled by default and cannot be downloaded. Firefox's help site states that one can go into Firefox and change this setting and allow unsigned add-ons to work, but it requires a high level of technical knowledge to even attempt to do this. To complicate things further, I was unable to get to the stated location and even attempt to make the change. In summary, WebVisum seems like an excellent tool; it is worth getting an invitation and waiting to see if it will again be available to use; however, it is unlikely that you will be able to use it right away. Getting WebVisum signed should be easy to do; however, it appears that its developers have chosen not to remedy the problem at this time. You may wish to contact the WebVisum team using the link on the site. The site does state that it may take a long time to get a response. The best hope, then, may be for many people to contact them, indicating to the developers that people want to use WebVisum. While you may encounter a site that uses a text CAPTCHA, such sites are few and far between. Expect to run into mostly inaccessible or only partially accessible CAPTCHAs. While the two resources outlined in this post have their limitations, they may solve the problem for most people who are blind and visually impaired. While other add-ons exists that claim to solve CAPTCHAs, CAPTCHA Be Gone and WebVisum were created specifically to assist people who are blind and visually impaired. We look forward to hearing about your experiences with these browser extensions. Hi. I wanted to provide the following additions to this post. You may still need to sign up with an account via the Webvisum page but at least the addon should officially work in current versions of Firefox. Hi. Not sure if there will be a date stamp on this comment but what I can tell you is that I'm more than a little displeased with CaptchaBeGone. I signed up for the $3 monthly subscription on 14 January 2018 and initially it looked like my payment hadn't gone through as my bank flagged it as a possible fraudulant transaction. However, undeterred, I carried on and despite my bank saying that the payment had not gone through and I would need to make it again, I did manage to solve 1 captcha on the amazon website. However, on Jan 15, when I came to use it again on the amazon.com website this time, I got a message that said that captcha solving had failed in firefox and chrome similarly and then on another it told me there was no captcha to be found. So, thinking that my initial payment had not actually gon through like the bank said and that my first solve had been a lucky glitch, I unsubscribed from the plan and re-subscribed only to discover the same outcome. I sent a support email in to the developers and heard absolutely nothing. I then tried installing the plugin on Internet Explorer and that just told me it was solving a captcha and hung. I then sent a DM to AccessibleApps on twitter yesterday morning and still nothing. Frankly though I'm not surprised. I had my misgivings when i saw who had developed the app as I bought a lisence for Chicken Nugget a couple of years back and the support for it was just as terrible. I ended up getting a refund via Paypal because the product did not work and was not fit for purpose and I was getting no response to my support emails. Don't touch Captcha Be Gone with a barge pole. The twitter account with this name hasn't been checked for over a year and despite the @AccessibleApps twitter account being regularly used, as of yet I've had no response, not even a confirmation to say that my original support request sent in via the web form has even got there ok. Thoroughly disappointed and hoping that the Rumola Captcha Solution recommended by David Goldfield is still available and works better.